1. PPR pipe and fitting system both for cold and hot water. 2. 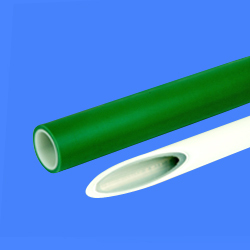 High temperature resistance, high pressure resistance and good resistance to chemical corrosion. 3. Long service life, healthy, non-toxic, sanitary and recyclable. 4. Hot welding connection adopted, making pipes and fittings into a whole, leakage effectively prevented. 5. Low noise, reduced by 40% compared to common pipes. 6. Light weight, easy to handle and transport. Size(mm): 20 x 3.0, 25 x 3.5, 32 x 4.0, 40 x 5.3, 50 x 6.0, 63 x 8.5.